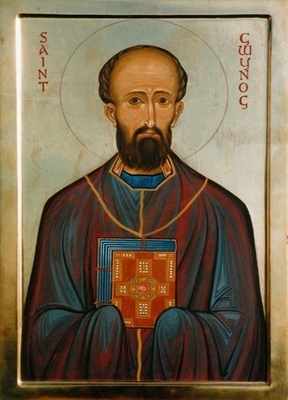 Gwynog was born in Wales in 511 A.D., the son of Gildas, 'a most ancient British historian' and a monk of Bangor. Gwynog was a pupil of St. Ffinnian, an Irish monk. Gwynog left the country to take refuge in Brittany with his father, who had stirred up the wrath of the Welsh princes. Gwynog took orders late in life and became Bishop of Vannes, but after rousing the anger of the King he was sent into exile. He died in Angers at the age of 69, in 580 A.D.